This entry was posted in DevOps, openshift. We must changed some settings on our NFS-Server. To prevent data corruption we decided to shutdown all pods. This sounds easy but I wanted that the same amount of pods are running after the shutdown as it was before the shutdown. I have created a text file where the settings are saved. You can check with the following command how many pods are still running. To shutdown all pods take some times. Maybe there are some pods still running then check this one and shutdown it manually. The pods in openshift-infra must be shutdown via rc. Now we have changed the setting on our NFS-Server. After the change you can restore the amount of pod. You may also need to take care of the logging project, which we have not setuped. Due to the fact that the current OpenShift V3 (3.1) only offer with Edge Termination a redirect from HTTP to HTTPS you will need a similar concept as described below. In a non OpenShift V3 you normaly handle the HTTP to HTTPS as following. 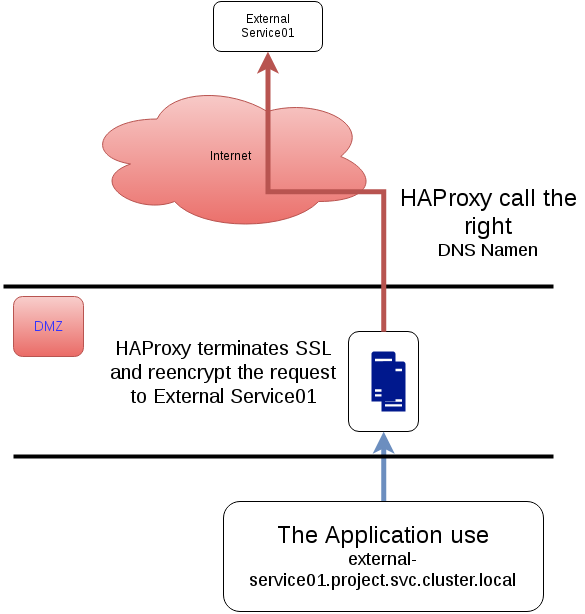 The application server or reverse proxy handle the HTTP request and sends a redirect to HTTPS. It’s a easy setup for the most servers out there. Due to the fact that OpenShift V3 is not able to handle one hostname in two backends the flow above will not work in the current ( 3.1 ) version. To be able to handle the redirect you will need something like this. This means you need to setup a dedicated Service with a haproxy < 1.6. Please take a look into the description of Server IP address resolution using DNS for full details. as described in OpenShift DNS . There is a RH Buzilla enty for this and also a github issue. This entry was posted in Misc, openshift.